A student asked me how to create a Vocabulary Enhancer (VocEnhancer) application using C#. A VocEnhancer application is nothing but an application that selects words randomly from a specified multiple options, so in consideration of those requirements and to help the student I have decided to write this article. 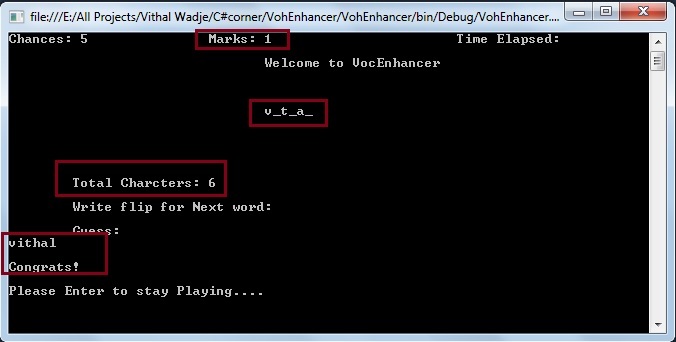 Before developing the application let us understand the conditions of VocEnhancer application. XYZ Inc. is a software development company that specializes in creating educational games for children. After doing a survey of the current market, the marketing team found that there is a great demand for software that helps children to improve their English vocabulary. Therefore, the marketing team proposed that the company should develop a new game that helps sharpen English vocabulary of children. One of the game designers in the company has suggested a game called VocEnhancer. It is a single-player game. There are three levels in the game, Beginner, Average, and Expert. The players would choose from these levels depending on their vocabulary. Depending upon the level, a few characters from an English word appear on the screen. The total number of characters in the word, the number of chances to guess the word, the marks scored by the player, and the seconds elapsed also appear on the screen. The marks, number of chances to guess the word, and the time elapsed is to be updated on the screen. The player must guess each word within the given chances. If a player is unable to guess any five words in the given number of chances, the game should be over. The player can choose any level. As the player selects the level, details of the highest score for that level should be displayed on the screen and then the game should start. Each level has a different sets of words. A few characters of a word are displayed on the screen each time. These characters are chosen randomly and are placed at the position where they occur in the word. The missing characters are indicated by blanks or underlines. The number of characters displayed on the screen depends upon the length of the word to be guessed. If the word is long then the characters displayed should be more and vice versa. The sequence of the words displayed should be random. The number of chances to guess each word should be five more than the number of missing characters in the word. The player gets one mark for guessing the correct word. The total marks scored by the user should be displayed on the screen and the score needs to be updated with each word guessed correctly. Open Visual Studio from Start -> All programs -> Microsoft Visual Studio. Then go to to "File" -> "New" -> "Project..." then select "Visual C#" -> "Windows" -> "Console application". After that specify the name such as VocEnhancer or whatever name you wish and the location of the project and click on the "OK" button. The new project is created. In the same way you can create files for Level1 and Level2. There is a need to create separate files for guessing words you can dynamically create them using C# string functions but to make it understandable for the student I have created separate files. The words of these text files will look such as follows. Keep the guess words sequence the same as the answer words file. Now right-click on VocEnhancer Solution Explorer and add the following class files. hint_Words_utility.cs: for reading hint or guess words from text files. CountUtility.cs: for counting the marks, chances and time. Now the VocEnhancer application Solution Explorer will look such as follows. Now open the "CountUtility.cs" file where we have created some entities, in other words varibales, to do a count then write the following code in it. Now open the "program.cs" file with the main functionality of the VocEnhancer application with the following code in it. 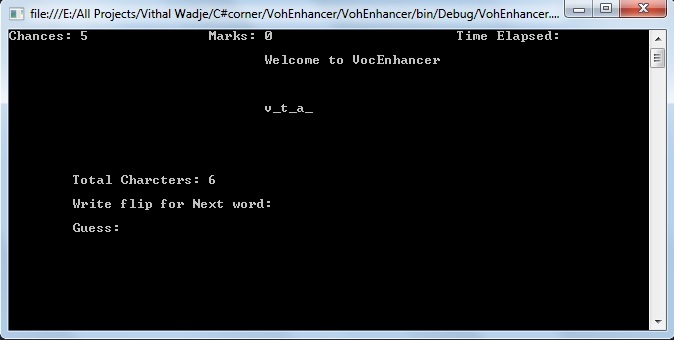 Now in the preceding class file we have written all the logic required to create the VocEnhancer application. I have used the same function for all three modes, please use the same logic as level one but provide a different word file path for each function, I hope you will do that since you are smart enough for that. Directly clicking on the .exe file from the bin folder of the VocEnhancer application. Now select any mode from the above, I will select Level1 Mode, so I need to press 1 from my keyboard. The following console screen will be displayed with options and words to be guessed. 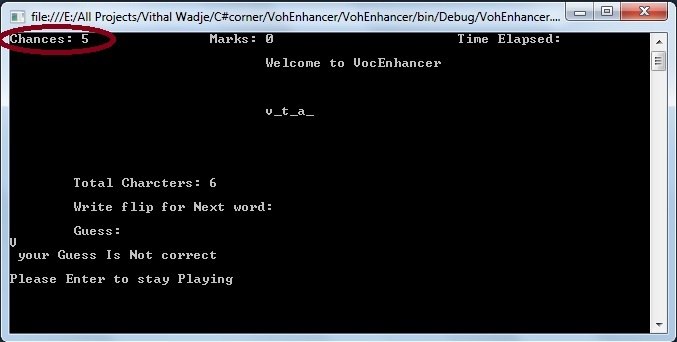 If you attempt five incorrect guesses then the VocEnhancer application will exit from mode and show the following message. From the preceding screen it's clear that our application is working and after each correct answer, the marks are increased by one. I hope you have done it. For detailed code please download the Zip file. Don't forget to create Text Files for words. Please don't use the code as is, use the example above as a guide and try improve it so in the future and for your career it's useful for you. Don't buy any project from an outsider, do it as your own skill, it will definitely be useful for getting a job quickly and easily. Invest your time and money in technical skill improvement instead of investing money for buying projects and if possible choose Microsoft technology for your career. For free guidance for any college project, you can contact with me or refer to the C# Corner site but don't buy any project in your final year. I hope this application is useful for students. If you have any suggestion related to this article or if you want any additional requirements in the above application then please contact me.